The Duchess of Cambridge was seen sporting an Alexander McQueen gown along with a pair of Jimmy Choo 'Romy in Viola' Glitter heels. The Duchess of Cambridge Kate Middleton looked stunning as she donned an Alexander McQueen dress to attend the star-studded BAFTAs on Sunday. Kate matched her stunning chiffon gown with a pair of Jimmy Choo 'Romy in Viola' Glitter heels estimated to cost around £525. The Duke of Cambridge Prince William accompanied his wife Kate to the prestigious event. The Duchess was seen coming face to face with and congratulating Olivia Colman who won 'Best Actress' for her role as Queen Anne in the 'Favorite'. Colman's co-star Rachel Weisz won the award for ' Best Supporting Actress'. In a tribute to Princess Diana, Kate was seen wearing the same South Sea Pearl accessories debuted by Diana when she attended a concert at the Royal Albert Hall in 1991. Kate finished off the look with the Queen's Quatrefoil bracelet and a small white clutch. She chose to wear pink lipstick and also had a dark smokey eye while she smiled for the cameras at the 72nd British Academy Film Awards at the Royal Albert Hall. William, who is the president of BAFTA, sported a black dinner suit for the event and also presented its highest accolade 'The Fellowship' to film editor Thelma Schoonmaker. 'The Favorite' is set in early 18th century England and tells the story of Queen Anne. While Queen Anne occupies the throne, her close friend Lady Sarah governs the country until a new servant Abigail played by Emma Stone arrives. 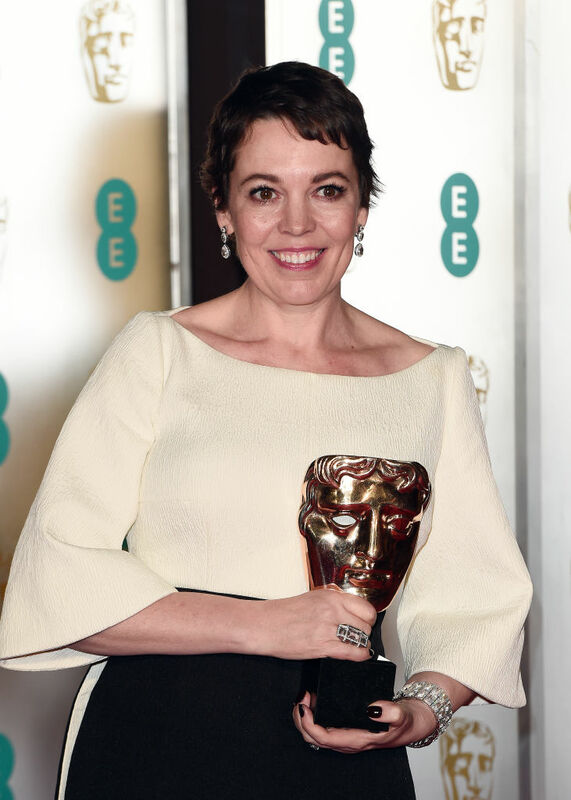 Olivia Colman is presently filming her role as Queen Elizabeth II in 'The Crown' and had to hold back her tears while she accepted the BAFTA. In her acceptance speech Olivia shared, "Thanks so much, it’s really big. I do know what to say, I’ve actually written something down. To my fellow nominees, to be in the same company as you is an extraordinary honor. I’m very shaky, sorry. We’re having an amazing night aren’t we? We’re going to get so p****d later. Emma and Rachel - I must keep it together - for your performances and what you did after the camera stopped rolling. We’ve never talked about this and I find it very emotional, but I love you." "This is for a lead, and as far as I’m concerned, all three of us are the same and should be the lead and it’s weird they can’t do that. It’s for three of us, it’s got my name on it but we can scratch in some more names," she continued. Olivia has also previously won Baftas for her TV roles in 'Broadchurch', 'Accused' and 'Twenty Twelve'. Weisz, who won the Bafta for Best Supporting Actress shared, "Olivia Colman, Emma Stone, need I say more? They are spectacular women. Chemistry isn’t something you can make up, you either have it or you don’t. I knew as soon as I laid eyes on them. They are glorious women."